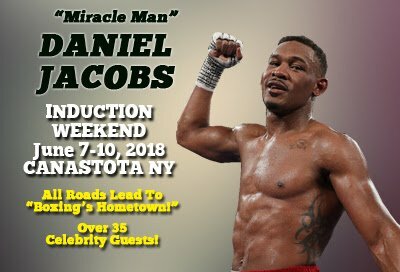 The International Boxing Hall of Fame announced today former middleweight champion and current top contender “Miracle Man” Daniel Jacobs will be in Canastota to attend festivities planned for the 2018 Hall of Fame Induction Weekend June 7-10th. Fighting out of Brooklyn, NY, Jacobs had a decorated amateur career before turning pro in 2007. As a pro he reigned as WBA middleweight champion from 2014-2017 and holds wins over Caleb Truax, Sergio Mora, Peter Quillin and, most recently, Maciej Sulecki (W 12) in a bout televised live on HBO from the Barclays Center in Brooklyn. The skillful Jacobs lost a narrow decision to 160-pound champion Gennady Golovkin in 2017. Known as the “Miracle Man” for his battle and victory over an aggressive form of bone cancer in 2011, Jacobs has a 34-2 (29 KOs) record. An impressive list of over 35 boxing greats from the United States and abroad are scheduled to participate in weekend festivities including Mike Tyson, Marvelous Marvin Hagler, Riddick Bowe, Miguel Cotto, Wladimir Klitschko, Marco Antonio Barrera, Kelly Pavlik, Antonio Tarver, James Toney, Micky Ward, Sergio Martinez, Leon and Michael Spinks, Gerry Cooney, Christy Martin, “Swift” Jarrett Hurd, Jessie Vargas and many more.